It is a painless and highly effective therapy for prophylaxis and treatment of such periodontal diseases, as gingivitis, periodontosis, and periodontitis. A gentle and soft removal of bacteriological biofilm and dental residues (plaque and tartar) by the means of indirect binding of ultrasound energy is one of the main features of this type of treatment. 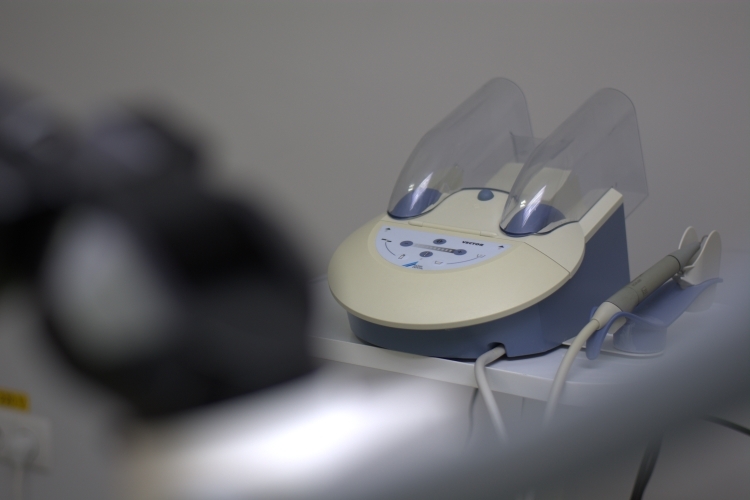 The treatment causes no damage to solid tissues or injury to soft tissues. Moreover, the effectiveness of root treatment is radically higher thanks to the suspension that contains microparticles of hydroxylapatite. Lateral vibration does not irritate the gum tissues of periodontal pockets and does not damage the surface of dental roots. Dental plaque, tartar, biofilm, and bacteria are removed by vibration of liquid around the special instrument. They are eliminated from the root surfaces to the very bottom of a periodontal pocket, even in the places which are hard to reach in the anatomic sense, like bifurcations (root conjunctions), without causing any tissue damage. The possibility of treatment of spots which cannot be reached by other dental tools (root junction and root ramus), as well as the entire surface of the tooth, without missing any bacteria accumulations. In the result, we eliminate all microorganisms which cause the inflammation and then launch the healing processes of periodontium. Afterwards, the removal of dental residue and the supportive vector therapy will be conducted every six months. Primary, secondary, and supporting vector therapies diverge from one another due to the use of different nozzles for the medical apparatus and different medical fluids. What is the cost of vector therapy? You can get the information regarding all stages of periodontitis treatment, with regard to your clinical case, using vector therapy in the course of a free consultation at the iStomatolog center.